Trazodone High Effects: How Does Snorting Desyrel Make You Feel? Popular Trazodone brand name Oleptro or Desyrel can make a person high when misused. This serotonin antagonist and reuptake inhibitor has calming and sedating effects, which are prone to abuse. Studies tell about Desyrel high potential when mixed with other substances. Can One Get High On Trazodone? How Long Does It Take To Get High On Trazodone? How Can One Get High On Oleptro? How Does Trazodone High Feel? Who Is At Risk Of Desyrel High? Can Recreational Use Of Trazodone Cause Addiction? Can You Get High On Trazodone? Although Oleptro has significantly less potential for abuse as compared to other medications, it is possible to get high on the drug. This antidepressant may not produce the traditional euphoric high as the opiates, but Trazodone mechanism of action can cause different neurological effects like regulation of mood, mental impairment, and sedative effects. So, yes, it is possible to get high on Trazodone. Antidepressant discontinuation syndrome is also well-documented among patients who took the drug for more than 6-8 weeks. They develop a physical dependence on the drug, hence increases the risk of Trazodone abuse. How Long Does Trazodone Take To Kick In? Users report that Desyrel can start to kick in as fast as 30 minutes after oral administration. However, how long it takes for Trazodone to kick in would also depend on some factors, including the type of Desyrel being used. The regular formulation of this medication releases the full dosage all at once, while the extended release formulation releases smaller amounts throughout the day. One can get high on Trazodone in many other ways aside from overdosing. Mixing Trazodone and alcohol can increase the odds for suffering from an overdose or abuse. Even taking a Trazodone 50 mg tablet may bring on the nervous system side effects like drowsiness, dizziness, and difficulty concentrating when mixed with alcohol. The use of alternative methods can get people high on Trazodone. People who misuse this medication crush several tablets to snort them and get Desyrel high. Snorting Trazodone by-passes the liver for metabolism. The mucous membrane of the nasal passage absorbs the drug quickly and delivers it directly to the brain via the blood-brain barrier. 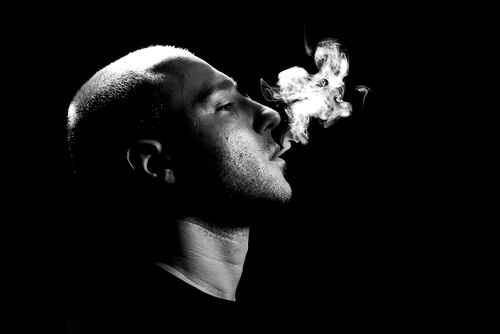 Smoking a non-tricyclic drug is possible. The drug is placed on a surface that can be heated. As soon as it starts boiling, it will produce a vapor that can be inhaled using a tube. This allows the medication to reach the bloodstream more quickly via the lungs and enters the heart before being pumped to the rest of the body. It brings an intense and immediate, but short-lived, Trazodone high effects. Some users report mixing the crashed drug with marijuana or tobacco and smoking this mix. Note that the off-label administration of the drug will harm the lungs and throat. Plugging medications is also an alternative method of use that utilizes rectal administration. It is an unusual route but is effective to become Trazodone hydrochloride high, according to some reviews. This method reaches the bloodstream fast because it also by-passes metabolism in the liver. However, this way of intake is relatively rare due to the specific administration and unproved efficacy. Injection, though not common, is being tried by others. It is done by injecting a needle to get the dissolved drug into a vein. IV administration can get drugs to the brain much faster as it avoids digestion and absorption in the gastrointestinal tract and metabolism in the liver. However, this has a higher risk of serious side effects and may potentially lead to Trazodone overdose death and infection, especially if the needle is not sterile. Trazodone drug interactions can also get one high. This drug may enhance the body’s response to barbiturates and other central nervous system depressants. Trazodone high gives users a light euphoric feeling and a good night sleep because of the drug’s sedative effect. Most enjoy uplifted mood, increased energy, and muscle ease. However, this feeling does not come without risks and consequences. Some also experience side effects like lightheadedness, excessive sweating, difficulty moving or talking, visual distortions, hallucinations, and nightmares. Others observed a pinpoint pupil appearance. Though rare, priapism may happen. Overall, patients who have a history of substance use disorder are more likely to abuse antidepressant drugs like Desyrel. Also, patients using this drug for periods more than 6-8 weeks to treat depression and sleep disorder may develop a physical dependence because of the relief that the drug gives them. Eventually, tolerance will build up, making the need for higher doses to maintain its calming effect. 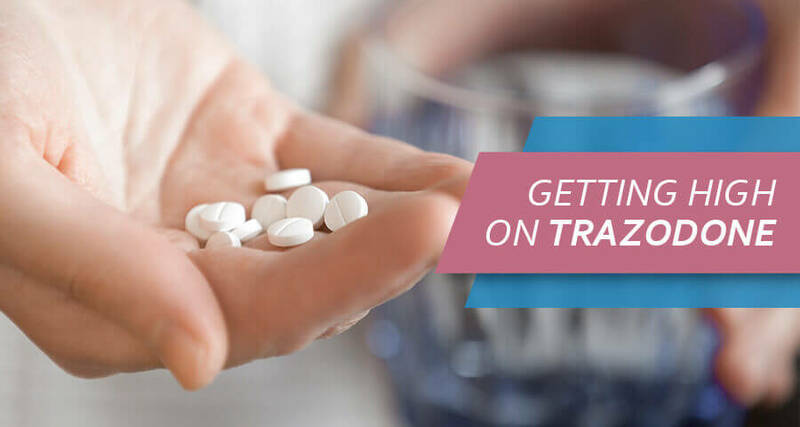 Trazodone street use or those people who take this drug for nonmedical reasons are also at risk as they usually combine this drug with other medications or alcohol. Trazodone recreational use can create a near-immediate sense of calmness and pleasure that’s often being compared to a morphine high. Every person reacts differently when they develop a drug addiction. Factors that will affect severity include overall health status, how much Trazodone to get high or dosage, duration of use, and consumption of other substances. One is addicted to Oleptro if there is a reluctance to stop taking the drug even when continued use proves to be detrimental to health. The user will also present with Trazodone adverse effects like headaches, nausea, dizziness, dry mouth, sweating, muscle pain, numbness, confusion, or Trazodone hallucinations. Abrupt removal of this drug can cause uncomfortable side effects. While considered different from drug withdrawal, the symptoms of antidepressant discontinuation are also real and serious, hence require medical supervision. Treatment at an accredited facility is highly recommended for detoxification to be effective. Doctors and nurses will work closely with patients to reduce the dosage over time to safely transition the patient off Desyrel and minimize the intensity of the side effects.